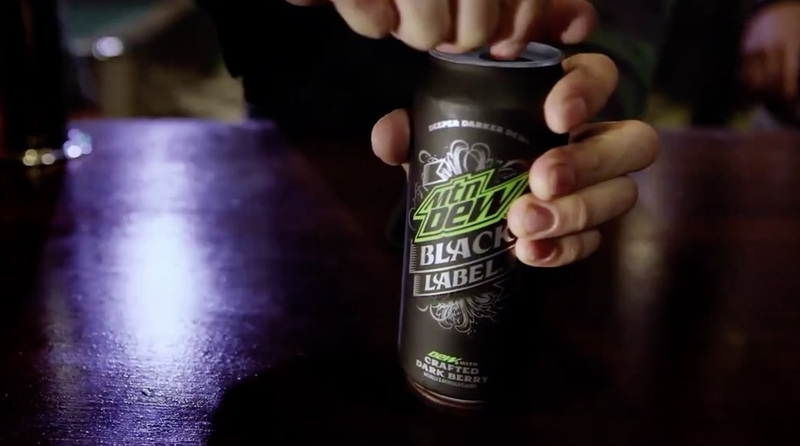 PepsiCo introduces Mtn Dew Black Label, a dark-berry beverage (with herbal bitters, no less), in a campaign from VaynerMedia that revolves around several "Gentlemen of the Jacket" who class up their respective acts. Professional skateboarder Theo Beasley gets things rolling in the centerpiece video below, appearing with two other millennial dudes—a mixologist and a gamer (both portrayed by actors). While enjoying some product, all three don magical jackets that make everything around them seem a bit more … sophisticated. The gamer steals it with that James Brown jacket move. Now that's some class action! The creative team strove to tell "a broader, connected story," even though the leads are never on screen at the same time, Sadira Furlow, Mountain Dew's marketing director, tells AdFreak. "The transitions from scene to scene consisted of one long continuous take to ensure each of the three environments were tied together seamlessly. The set was built to adhere to this flow," she says. Fifteen-second versions of the gamer and skateboard portions of the ad will run as hyper-targeted pre-rolls, while the full-length clip is being promoted across Mountain Dew's social platforms. "One of the funniest things to film was the skateboard with the can on it," Furlow says. "Believe it or not, it is incredibly difficult to get a can to sit on a mini-throne on a skateboard and move up and down a ramped surface at full speed. We even had a skateboard/can handler responsible for pulling it along." It's a great-looking ad. And as with most Mountain Dew campaigns, it's well attuned to its youthful bro-centric audience. Still, there's some disconnect here. Why employ a jacket at all? The idea is never really explained or explored. Also, why would rebel types like skateboarders and gamers care about acting all sophisticated anyway?